I can't remember where I got it though, but i think it was from a friend. I'm not sure if u can tell but the little dots with sparkles trailing behind them are fireflies ^^'' it was my failed attempt at them. Hope u like it! EDIT: yea i remember now! the scan was from my friend, Sarah ^^ I still had to extract and clean, but it was already really good ^^ So thank u sarah for the beautiful scan! It's quite romantic. I wish I could sit on her side now. i love this wall, is going to my computer, is really good, l love chobits! it looks gorgeous!!!!! i aodre it! and chii looks so kawaii! :) good work! 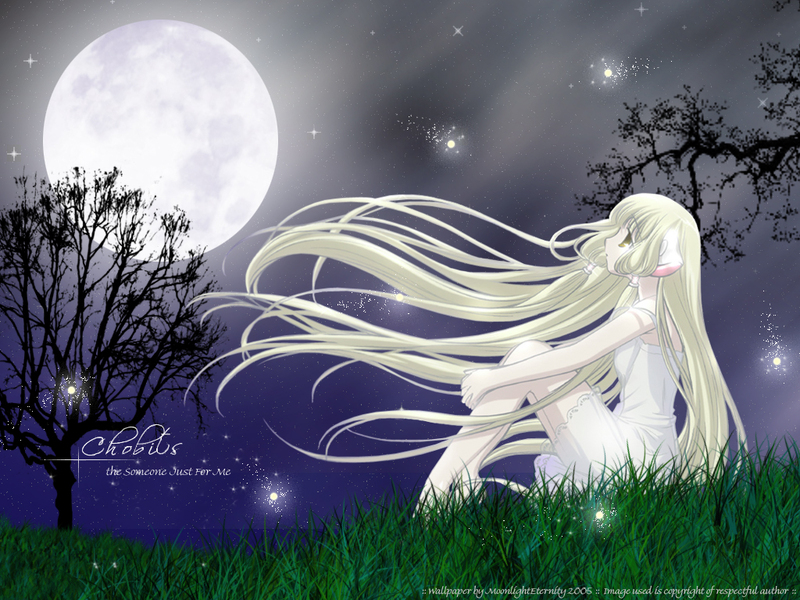 Very cool, plus i love chii... the only thing i can find to critisize on are the stars, i find it to ambient to look real. Other than that, good job. Wow! It's beautiful! I love the scenic background you made, MoonlightEternity. The bavkground really goes along well with the character Chii. Keep up the good work! Fantastic wallpaper, nice theme, magnificent scene. It's flawless and fabulous. The dark sky with a few stars and a big round moon in the air. sorry! i couldnt comment on ur wallie be4! hehehe...aw....chis looking sad in this wall! and i love love love the background!!!!!! so so so so awesome!!!!!! and the moon is very realistic, as well as the grass, and trees, and stars!! Hello there. I t's a nice wall and the sky is too cool with the fx and the stars. It's a nice theme and Chi looks nice. *I'll add to my fav. * Keep up the good work. I didn't expect everything to look so nice close up. I don;t know how you did the grass or the trees, but they look great. Also Chi's cutout job is nicely done as well. the only thing I don;t care for is the trails from the fireflys being too pixely? (is probably not a real word) and taking away from the smoothness just a bit? The colors are a little dark but help the setting, also the grass layer and trees seem to create a false midground that acts weel with the sky background.